… the SFR Brigade 2nd annual midsummer blog hop. Check back anytime between June 21 and June 25 to hop and win. I’ll be escaping the Arizona heat for a visit with my son, a geographic information specialist at the University of British Columbia. 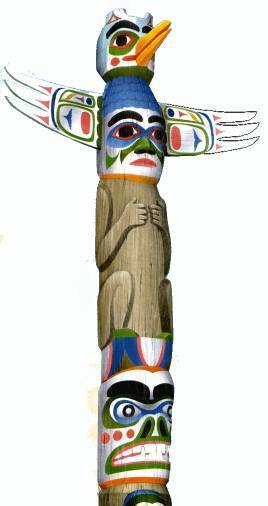 I love BC’s totem poles, and UBC has a great collection. I’ll have Internet access, so if you want to contact me, feel free. Speaking of totem poles, I’ll never forget the time I discovered one. Fresh out of university, I taught at a one-room school on a wilderness island along the Inland Passage section of the B.C. coast. The only way in or out was by four-seater bush planes that landed on the chuck (local slang for the ocean). The kids came to school on a school boat, because the island had no streets or cars. Not TV or radio, either. One weekend, following game trails (what else was there to do? ), I stumbled upon a small, white beach. I knew that the Kwakiutl First Nations people ate a lot of clams, and old, pulverized clamshells turned the beaches near their settlements white. Realizing this was the site of an ancient village, I looked through the dense underbrush at the beach’s edge. Sure enough, a rotting tree stump wasn’t a stump at all, but the barely recognizable remnant of a carved pole. Beaver, I think the totem was, though it was so far gone it was hard to tell. It smelled fresh and earthy, like the rain forest after a rain. Vivid green moss grew over chunks of the grey, weathered cedar. Where the top of the pole had snapped off, a sapling grew in the rotted red wood. Rotten or not, I’ll never forget finding that pole.